Frilight Opal P 8000 Reading Light, 12-24 Volt Halogen or LED Light with tear drop base, translucent glass shade and standard rocker switch. Marine quality LED reading light fixture by Frilight. Decorative base hides mounting hardware and the light swivels right, left, up and down. 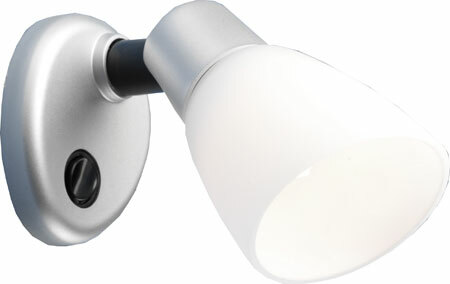 Select a G4-pin style bulb: 12 volt Halogen or energy efficient 12-24 volt LED. This LED is able to function on an input of 10-30 volts DC. 245 Lumen Bulbs in Warm White or Cool White available. 182 Lumen, Warm White bulb is on closeout!